Discussion in 'Lasershow Designer BEYOND' started by Pucti, Apr 25, 2016. IÂ´m doing many things with DMX, and it was no problem to get it work from inside Beyond. Using Artnet Interfaces i can operate all my devices with the sliders. But -- iÂ´m using some DMX inside LD2000 shows to switch flame generators, projection screens, lights, water pumps and so on. All working perfect with LD2000 and DMX output of the QM2000 boards. Now i imported several shows with DMX frames into Beyond (Essentials and Advanced versions) but i will not get any output from DMX. 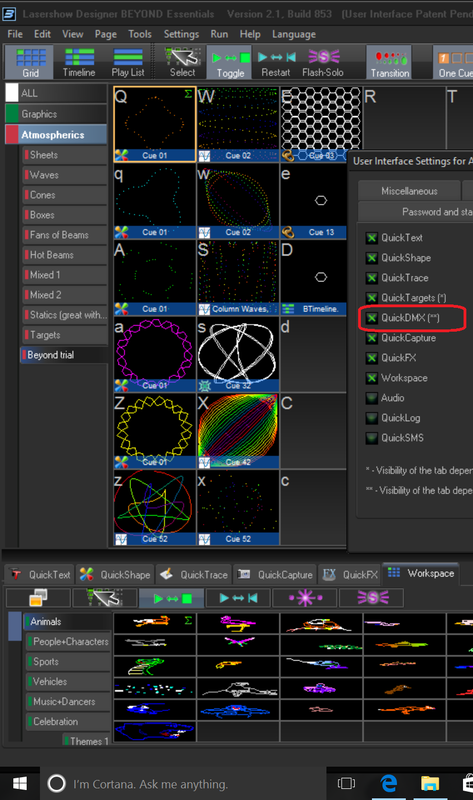 IÂ´m also not sure, how to see the content of the imported DMX frames or how to create new ones. I have looked into the tutorials of Beyond, but couldnÂ´t find any hints. It needs to be enabled to show up. You will find it in the bottom area of your view screen.